Create Sensor, configure your dashboard and try out all the main functionalities to suit your needs. A sensor is a communication channel with unique Api Keys where AskSensors collects and stores user's data. Each Sensor provides up to 6 Modules with shareable graphs where users can send data stream to each module separately. 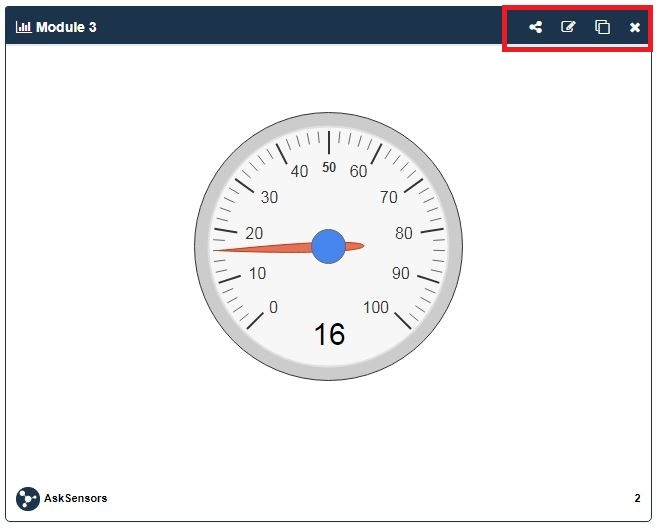 From your project dashboard, you can create a new sensor by clicking on 'New Sensor'. Fill your sensor name and description. Add up to 6 modules and click on 'Save'. - Sensor Name (on the top): The sensor name you have entered. - Sensor ID: a unique sensor ID. - Author: the sensor author. - API Key In: a unique code you will need to write data to this sensor. - Description: The Sensor description you have entered. - Click 'Clear sensor' to delete all data stream storied in this sensor. - Click 'Disable Sensor' to disable the sensor. no data will be received on this sensor. - Click 'Generate Api Key' to generate a new API KEY for your sensor. Add Graph: Click 'Add graph' button to associate graphs to your modules. There are 7 type of graphs: Line, Scatter, Bar, Gauge, Table, Binary and Digital. From the Add Graph window, Choose the graph type, and its configuration and click 'Save'. The image below shows an example of Line Graph. Email Alert: Click the ‘Add Alert' button to receive an email alert when the data read on your module exceeds a configurable threshold (Min/Max Value). A periodic check will be performed depending the Min Interval value (e.g. 30min means that your module data will be checked every 30 minutes, if at least one value has exceeded the threshold, you will receive an email alert). Export data: Click the ‘Export CSV’ button to export all the data stored in this module to a CSV file. Each AskSensors Graph allows four main functionalities that are available through the four icons on the righ top of the graph, as shown in the next figure. Starting from the left, the ‘Share chart' icon generate a shareable URL that you can use to share your graph with your friends and colleague, or embed it in your web application. Click 'Edit chart' if you need to modify the graph configuration. Click the 'Open chart’ icon, to view your graph data stream in full screen. The remove icon hides the graph from your dashboard.